Crude inventories fall by 9.6 million barrels in the last week, compared with analysts’ expectations for an increase of 309,000 barrels. Crude futures draw support from OPEC-led supply cuts and U.S. sanctions against Iran and Venezuela. Analysts say concerns over economic growth are weighing on the market and capping gains. Crude stockpiles dropped by 9.6 million barrels in the week through March 15, the U.S. Energy Information Administration. That compared with an estimate for a buildup of 309,000 barrels in a Reuters survey of analysts. Meanwhile gasoline inventories fell by 4.6 million barrels, nearly twice the decline expected in the Reuters poll. Stocks of distillates, including diesel and heating oil, dropped by 4.1 million barrels, almost four times bigger than the expected drawdown. Overall, the EIA report was “pretty bullish,” with gasoline demand rivaling consumption during peak season, said John Kilduff, founding partner at energy hedge fund Again Capital. “You’ve got to believe we’re due for a Trump tweet at some point, but I think with demand, these drawdowns, and the refinery snags we’ve been having, it’s kind of a bullish setup,” he said. 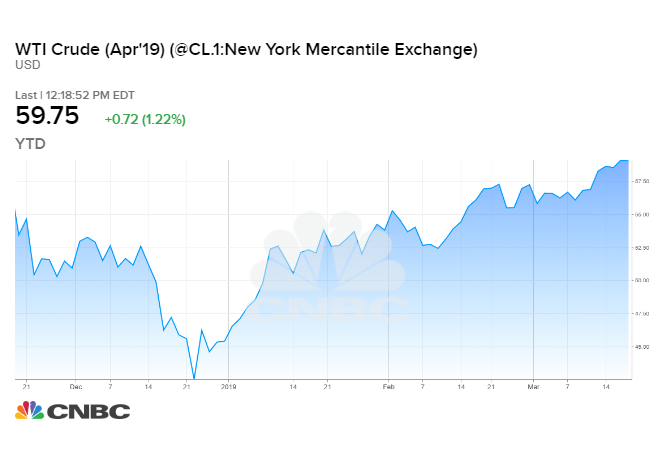 President Donald Trump resumed his warnings for OPEC to tamp down oil prices in February, but has since held his fire despite the cost of crude ticking higher over the last month. Crude futures have drawn support this week from OPEC’s ongoing supply cuts. On Monday, the group canceled a meeting planned for April because it expects the oil market to remain oversupplied through the first half of the year. The move leaves price-boosting production cuts by OPEC and its partners in place until at least June. The group is aiming to keep 1.2 million barrels per day off the market following the collapse in oil prices last year. “Conversations with several OPEC officials left us with the impression that Brent in the mid-$60s is not where the cartel would like to see it,” the investment bank said in a research note Tuesday. Saudi Energy Minister Khalid al-Falih says he is leaning towards continuing the deal into the second half of the year, but Russia is not committing to an extension yet. Earlier on Wednesday, crude futures retreated from four-month highs struck in the previous session on concerns about the global economy. Those reports are creating a headwind to bullish factors, Kilduff said. The market will next look to Federal Reserve Chairman Jerome Powell’s press conference after the central bank announces its latest decision on interest rates. Surging U.S. crude production and exports are also keeping a lid on prices. The nation’s output is holding steady around an all-time high 12.1 million bpd, while weekly exports hit nearly 3.4 million bpd, just below a recent record, EIA said.